If you don’t know already the suspected terrorist attack on the cruise liner, Spirit of Kirkpatrick, is from the book by the same author, Seasick. It is not necessary to the book to read Seasick first, but it’s a nice little fact, I think. Jan’s son Damien is a character in Final Storm. I love how Iain Rob Wright uses connections like this. Nick Adams is our lead. Unsatisfied in his phone shop managerial job he seems to nevertheless be a nice guy. Going home to his wife and son he does seem worried as they’re both becoming ill with what is presumed to be a particularly virulent flu bug. Accidentally killing his rabid son he is unable to reach emergency services and then has to combat his rabid wife. Things are not going well for Nick. There is a nice and realistic feeling to Nick. He seems exactly like a normal bloke and you go along with him as he struggles to cope with and understand the devastation happening around him. We meet Eve and Dave and Pauline as well as the other passengers on the bus that Dave drives. We see their first deliberate violence against the infected and the confusion and effect it has on them. Never, ever mention those words. Things can and do ALWAYS get worse. Introducing Annaliese in part two and allowing us to follow another characters point of view and experience of the virus is refreshing and appreciated. We watch as she finishes a gruelling shift as a zoo vet and how she first comes into contact with the infected. We’ve seen Nick risk himself to save the other members of his little group of survivors and bore witness to Dave attempting to be the group leader. We now see this with Annaliese as Shawcross attempts leadership and Anna is willing to risk her life so her small group of survivors have a chance to escape to safety. I like that the settings are real. Nick ‘s house, the road, a bus, a hotel, a small animal park/zoo. Real places were you may attempt to remain safe and hidden during the whole end of the world zombie apocalypse thing. I love that Annaliese’s character is flawed. She’s not a perfect hero. She has suffered in her life and she turned to drink to cope. The scenes that involve her and Lily the orangutan are written so well. Seeing Lily loose her family too was heartbreaking in a way that only a skilled writer could make you feel. Part three reverts back to Nick ‘s view point. It shows the two groups of survived coming together. I feel I need to point out that although this is a zombie horror, the zombies themselves are secondary to the trials of coping with the unexpectedness of the end of human life as we know it. It feels like so much more than a standard novel about zombies, Iain enthralls you with the dynamics of people and the complexities of the intermingling of people who would not normally mix. The add of Lily brings a much deeper sympathy. You see people connect with her in so many ways and each is touching. I love the description in these scenes that capture you with a little bit of wonder in the otherwise bleak world of survival. Watch as power threatens to corrupt in even these dangerous times. See how the group divides and who makes it out. Don’t stop after the epilogue. Read through Path of Infection Seasick to find out how Nick ends up in line after the boat explosion. This novel can stand alone but as I mentioned earlier Seasick explains what came first, and is set on the boat Spirit of Kirkpatrick, the one that exploded on the Mediterranean. 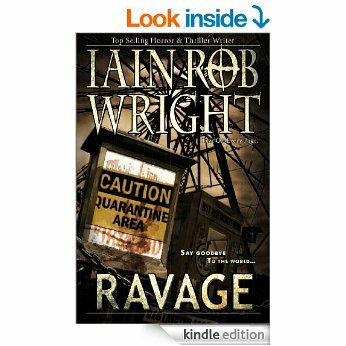 Then the story continues in Savage. « Review – The noodle kitten art series – Ryoko San.